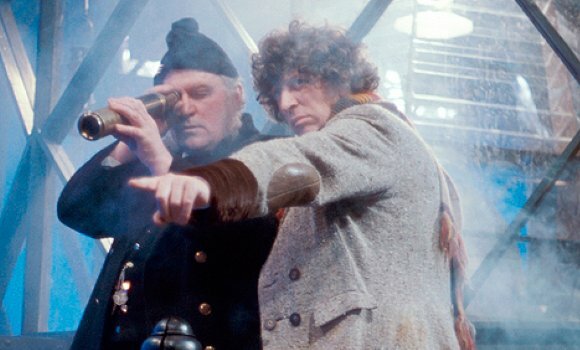 Counting down the 11 4 days to the 50th anniversary, here are my top 11 stories for each Doctor, continuing with 4 (Tom Baker). The scarf, the wild hair, the googly eyes, and the wicked grin. 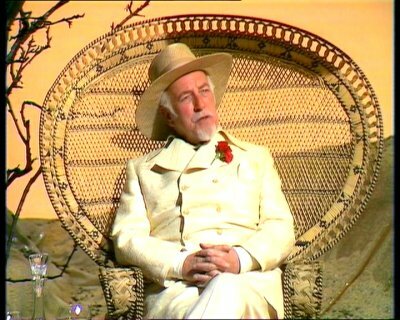 This is the classic Doctor the most people think of when someone said “Doctor Who” before 2005. This pig thing is still alive. Needs an operator, of course. But the mental feedback is so intense that somehow the swinish instinct has become dominant. It hates humanity, and it revels in carnage. 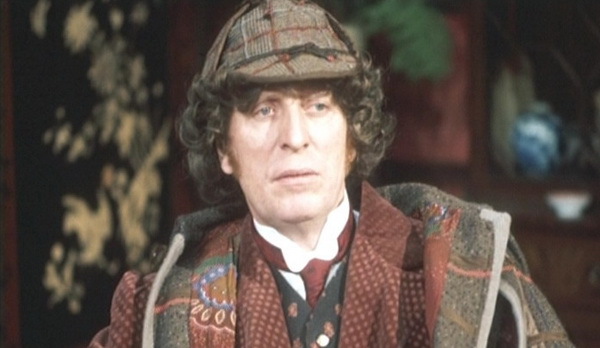 Doctor Who does Sherlock Holmes. The Doctor brings Leela to Victorian London where women are disappearing off the streets. The trail leads to a theater where a Chinese magician, Li H’sen Chang, and his strange ventriloquist dummy, Mr. Sin, are performing. The proprietor, Jago, teams up with the local mortician, Professor Lightfoot, to help the Doctor and Leela solve the kidnappings. Meanwhile, strange things are going on in the basement of the theater. Do I have the right? Simply touch one wire against the other and that’s it. The Daleks cease to exist. Hundreds of millions of people, thousands of generations can live without fear, in peace, and never even know the word Dalek. The Time Lords send the Doctor back to the creation of the Daleks on the planet Skaro to try and prevent it from happening. 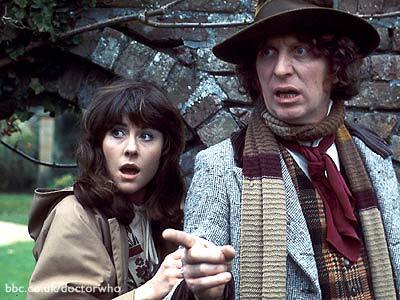 There, he and Sarah Jane and Harry are caught in the war between the Kaleds and the Thals and the cast-off mutants of the no-man’s land. The scientist Davros, more machine than man, has created the ultimate weapon to help the Kaleds win the war–the emotionless killer mutants housed in their Mark III travel machines that he calls Daleks. What a wonderful butler. He’s so violent! The Doctor and Romana are on holiday in Paris. There, they run afoul of a detective who is tracking art thieves and the thieves themselves. Millions of years earlier, an alien spacecraft exploded on take-off from Earth. The explosion not only sparked the origins of life on the planet, but also split the alien pilot across time into several splinters of himself. They have a plan to sell multiple copies of great works of art across the centuries in order to fund a device that will merge themselves back together before the explosion, thus surviving and wiping the human race from ever being born. I’m a Time Lord… I walk in Eternity. In a Victorian Gothic mansion, the master of the house, away in Egypt, has been replaced by a sinister Egyptian. Cloth-wrapped Mummies roam the grounds killing people. Beneath a pyramid, the last of the Osirians–Sutekh the Destroyer–waits to be freed to at long last bring his gift of death to all who live. 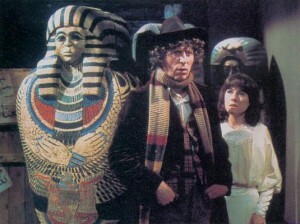 The Doctor and Sarah Jane must stop him. That chap you called in from Unit: is he quite sane? A pair of alien pods is found in the Antarctic. Before the Doctor can prevent them from hatching, an insane plant lover, Harrison Chase, takes them to his green house and releases them, setting loose giant, man-eating plants. I never carry weapons. If people see you mean them no harm, they never hurt you – 9 times out of 10. The TARDIS materializes inside a giant sand-miner where the crew is apparently being murdered, either by one of their own or one of the robots on board. 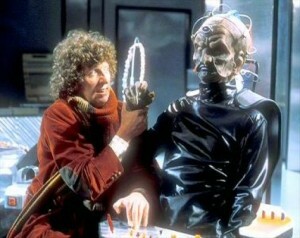 When the Doctor and Leela arrive, suspicion falls upon them instead. Would you mind not standing on my chest, my hat’s on fire. 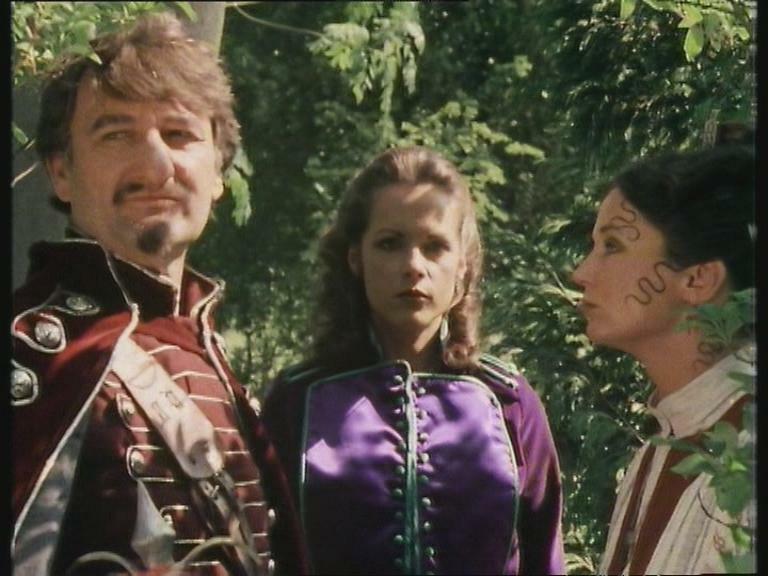 The Doctor and Romana arrive at Tara for a rest during their search for a segment of the Key to Time. They find that there is unrest in the politics of the area, as android doubles and a princess who looks exactly like Romana are making things difficult for the coronation of Prince Reynart. 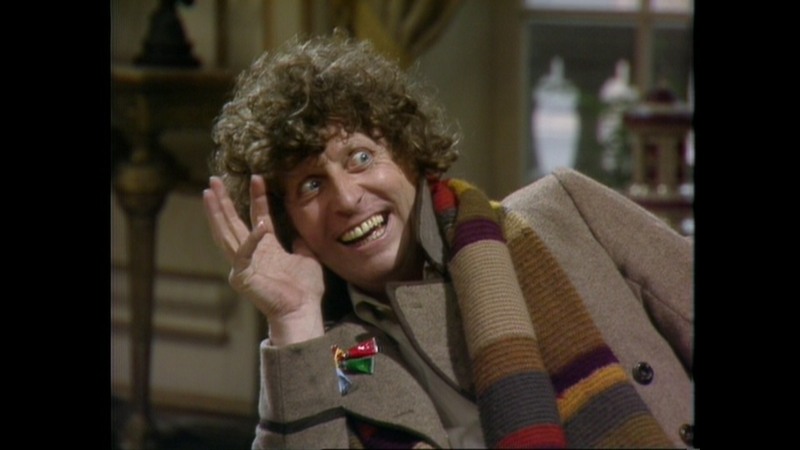 The Doctor: …One more thing. Your name. Romana: What about my name? The Doctor: It’s too long. By the time I’ve called out, “Look out…” What’s your name? The Doctor: By the time I’ve called that out, you could be dead. I’ll call you “Romana”. 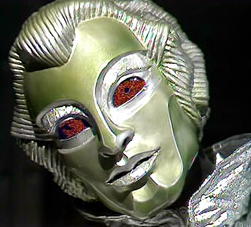 Romana: I don’t like “Romana”. 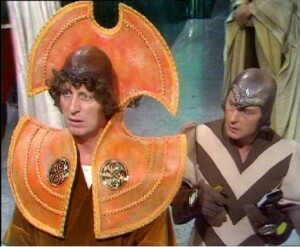 The Doctor: It’s either “Romana” or “Fred”. Romana: All right, call me “Fred”. The Doctor: Good. Come on, Romana. Saddled with a new companion, a recent graduate from the Time Lord Academy, the Doctor is tasked by the White Guardian to find the segments of the Key to Time. His first stop is Ribos, where he and Romana and K9 become entwined in a plot by a con man to sell a planet to an unstable war lord. Gentlemen, I’ve got news for you: This lighthouse is under attack and by tomorrow morning we might all be dead. Anyone interested? The cursed island of Fang Rock, off the south coast of England, is a place of tales of beasts from the sea. Three lighthouse men at the turn of the century face their fears when something comes from the sea to bring death to all it touches. The Doctor and Leela arrive to investigate. We have him now, but beware. The Doctor is never more dangerous than when the odds are against him. The Doctor is summoned back to Gallifrey for an emergency session of the Council of Time Lords. They are electing a new President, but in the shadows lurks his old enemy, the Master, and soon the Doctor is accused of assassinating the President-elect. You really can’t go on calling yourself Morbius. There’s very little of Morbius left. Why don’t you think of another name? Potpourri would be appropriate. Doctor Who does Frankenstein. 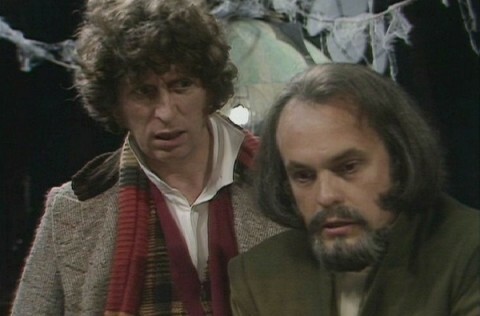 The Doctor and Sara Jane arrive on Karn at an ancient castle where the mad scientist Solon is trying to rebuild the evil Time Lord Morbius from spare body parts. He figures the head of the Doctor would do just nicely. Meanwhile, the Sisterhood of Karn, guardians of the Sacred Flame and the Elixir of Life, use their psychic powers to crash the ships from which Solon obtains his body parts. The Sisters, who once shared the Elixir with the Time Lords, think that the Doctor is there to steal it and sentence him to die.